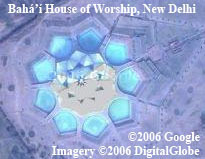 This post is for those who like to see aerial views of the Baha’i Shrines and Temples from mapping utilities such as Google Earth or Google Maps. These locations are optimised for use with Google Earth, but should be fairly accurate with other mapping aplications. With Google Earth, or Google Maps, you can simply paste these locations into the search bar to zoom into them. Thanks go to this site, Dan Jones and Danoush Ahmadi for help finding some of the above.